We had a local cinema in the town where I grew up. It was, quite frankly, a bit of a flea pit. and often, when watching a film, you would have a little break in the middle. Not a desired break of course, an enforced one while the projectionist sorted out the relevant problem. The cinema certainly had some charm about it though, and was a far cry from the modern multiplex that has now replaced it. 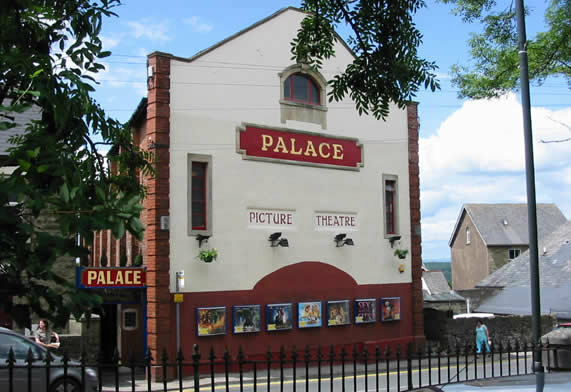 The Palace in Cinderford started life in a similar style. It originally opened in 1911 and sadly closed in 1966. By the time Mark Cunningham bought the building in the late 1990's it was faded grandeur in need of great repair. But Mark had a vision. By 2001 he had reopened The Palace and restored it to much of its former glory. It had been a dream of his for many years to restore an old picture house and when the dream came to fruition it was much welcomed by locals. Finally that big old building was once more put to good use. Mark opened the cinema with the original "theatre" as the auditorium. It had a narrow hallway as an entrance with 1930's style kiosk, light fittings and pictures. As you walked into the theatre you could imagine how it might have been in the early 20th Century with a pianist at the front. The result was stunning, and it drew me in immediately as one of its regulars. It had a charm and elegance of days long before my time, but somehow in this cinema I could identify with that era and imagine myself as part of a bygone age. The cinema was again resold in 2005 to Andrew and Karen Lougher. As a local couple they knew of the cinema's history and when both were in need of work due to being made redundant, they decided to go into business running The Palace. Seven years on and it now has two theatres, new seating throughout, a 1930's style coffee shop and all the blockbuster films. In the early days these were missing from the repertoire, as it seems that a cinema has to build a reputation with the film producers in order to be on the list for early distribution. The great thing about The Palace though, as well as enjoying the feeling of a more elegant age, is that the prices are still so reasonable. The drinks and snacks don't cost a fortune and there is always nearby parking. And, probably most importantly, there is a feeling when you visit that somehow you are part of a sort of private gathering. When I went to see the midnight showing of the final Harry Potter film on the hour that it was released in July 2011, the whole audience clapped as the film ended, and it felt as if we were at the premiere of the film. Of course we knew that we weren't, but somehow this wonderful venue made you feel very special. This week we went to see Skyfall there and, if you haven't already seen it, I would certainly recommend it. More importantly though I would recommend that you enjoy the film in the surroundings of The Palace Cinema in Cinderford. The ticket prices are very good. It costs at least £8 these days to go to the cinema.